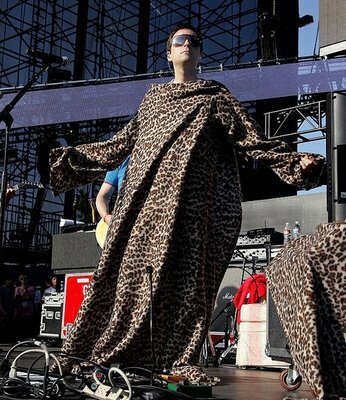 Weezer lead singer Rivers Cuomo rocks a Leopard Snuggie in the picture below. Want a Leopard Snuggie of your own? Order Leopard Snuggie Now! Rock band Weezer recently created a Snuggie Infomercial to promote their new album Raditude. Band members Rivers Cuomo, Brian Bell, Scott Shriner and Patrick Wilson love Snuggies. So they decided to partner up with the company they love and sell their album with a Snuggie as a bundle pack. 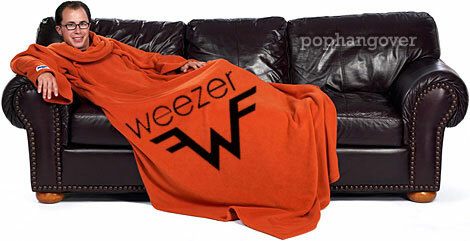 Snuggies, or the “blanket with sleeves” are now available emblazoned with the logo of rock band Weezer.